IN OUR OPINION, this is the best dog behaviour DVD currently available. We use some of Jan's methods when training our own dogs to ensure control and good manners. Done properly, they always work. 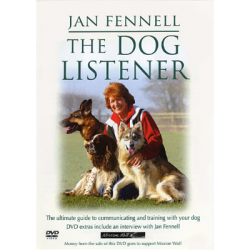 We recommend the DVD to anyone who asks for advice with dog behaviour training. This DVD is probably unique! It shows you how to start working your border collie on a variety of livestock - cattle, sheep and ducks. There's much good sense and insight packed into 90 entertaining minutes, and the training methods are kind and easily understood. To prove a working sheepdog can become a good trials competitor, Glyn Jones takes two very different dogs and handlers through their paces. Donna Jones' dog, Zac, works daily with a large flock of sheep; in contrast, Marion Turner's Lynne is kept on a smallholding and works less often. At the end of Glyn Jones' programme introducing sheepdog training, Come Bye! And Away!, Glyn's trainee sheepdog Lad, had learned the four basic commands and could perform straightforward tasks such as the drive. In this sequel, Glyn Jones demonstrates how he teaches Lad more specific commands, then reduces command contact. Over 16 chapters, volume three covers a variety of challenges, such as how to get sheep away from a fence or out of a corner and understanding the point of balance. * * SAVE UP TO 20% when you buy more than one of our own TUTORIAL DVDs. Chapters 18-35 of our Tutorials, now on DVD. From improving control and steadying the young sheepdog's work, through pen and yard work, and preparation for sheepdog trials. * * SAVE UP TO 20% when you buy more than one of our own TUTORIAL DVDs. FROM CHAOS TO CONTROL! Sheepdog training as it really is "warts and all"! Professionally recorded, and clearly presented by sheepdog trainer Andy Nickless. * * SAVE UP TO 20% when you buy more than one of our own TUTORIAL DVDs.